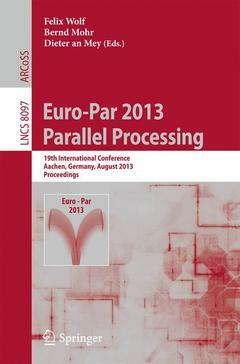 This book constitutes the refereed proceedings of the 19th International Conference on Parallel and Distributed Computing, Euro-Par 2013, held in Aachen, Germany, in August 2013. The 70 revised full papers presented were carefully reviewed and selected from 261 submissions. The papers are organized in 16 topical sections: support tools and environments; performance prediction and evaluation; scheduling and load balancing; high-performance architectures and compilers; parallel and distributed data management; grid, cluster and cloud computing; peer-to-peer computing; distributed systems and algorithms; parallel and distributed programming; parallel numerical algorithms; multicore and manycore programming; theory and algorithms for parallel computation; high performance networks and communication; high performance and scientific applications; GPU and accelerator computing; and extreme-scale computing. Support tools and environments.- Performance prediction and evaluation.- Scheduling and load balancing.- High-performance architectures and compilers.- Parallel and distributed data management.- Grid, cluster and cloud computing.- Peer-to-peer computing.- Distributed systems and algorithms.- Parallel and distributed programming.- Parallel numerical algorithms.- Multicore and manycore programming.- Theory and algorithms for parallel computation.- High performance networks and communication.- High performance and scientific applications.- GPU and accelerator computing.- Extreme-scale computing.